I’m very lucky to have lived and worked in Vancouver for the development of this wine club. Wine vendors in Washington share stories, share wines, and have a comraderie not experienced in Portland. Portland vendors are more competitive and cut-throat, acting as if each vendor is vying to take away their income and throw them to the gutter if given the chance. In Vancouver, vendors regularly meet and test wines not only for customers, but for each other, to stay abreast of the market and to maintain an objective palate with which to judge their own offerings. 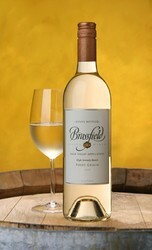 It is at one of these combined customer/vendor sampling mornings that I was presented with the Brassfield 2006 Pinot Grigio. Usually, I would be unenthused. Most Gris wines are drab and fruit forward, made for sipping on a summer afternoon as a refreshing afterthought. This is unfortunate, since well-done gris can pair with a vast majority of foods, be refreshing, AND provide some contemplative depth to remind you of the artful craft of winemaking. This is one of those Pinot Gris. Alsatian grape variety clones from France’s most famed Pinot Grigio region are grown to provide the fruit. The wine “emits a dazzling forward bouquet of orange blossom, vanilla bean extract, pineapple and Bartlett pears, remaining crisp with a balanced acidity, medium body, and lingering finish” according to the winery. But I would add that the wine has a vein of dry minerality that cleanses the palate and provides a slight layer of stony, smoky character. Thankfully, it made me crave something great to nibble, which a good Pinot Gris should do. Chill it down, grab some cheesy appetizers, a bowl of creamy pasta, or a chef’s salad and head out to the patio on a warm day. This wine will capture the moment. This wine is regularly sold for $11.99, but is available to wine club members for only $9.99!